Plot: It’s another brand new day for Spider-Man. 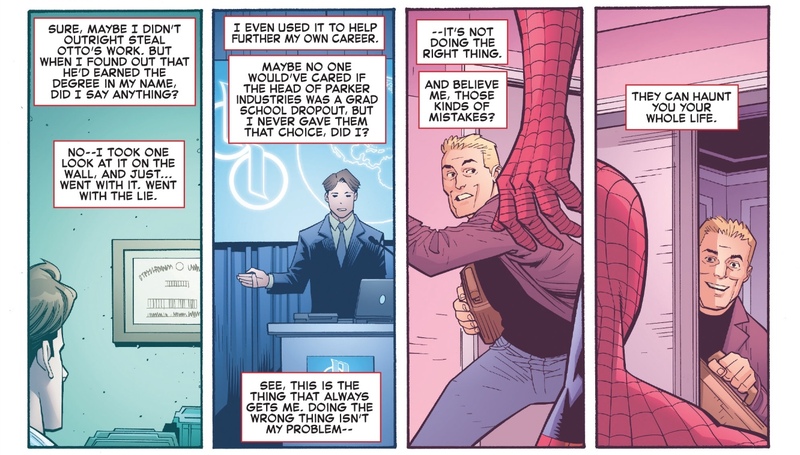 Unfortunately the Parker Luck returns with a vengeance when Peter Parker’s graduate degree is revoked for plagiarism. Plus Peter’s dealing with an annoying roommate who’s also the super villain, Boomerang. However after a battle with Mysterio, Peter decides to get his life on track which leads to the moment Spidey-fans have wanted for years. Story: Initially I wasn’t a fan of Peter getting fired from his new job immediately following Dan Slott’s run. 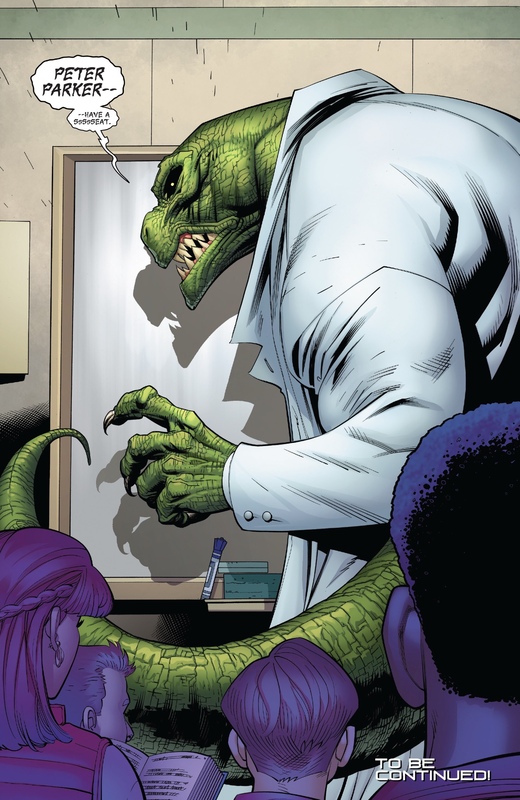 However, Peter sees the damage his failure to correct Doc Oct’s actions from Superior Spider-Man such as Aunt May’s disappointment, this allows Nick Spencer to explain why he took this route and what it means for Peter Parker as a character. This gives us a great montage where Peter thought by not clarifying the mistake he could do more good but ultimately it was the wrong decision. Fortunately Peter gets the opportunity to re-earn his degree by retaking the course which is taught by Dr. Curtis Connors (a.k.a. the Lizard). Even though Conners has always been Peter’s teacher in various Spider-Man movies and TV shows, this is the first time Peter is Connors’s student in the comics. This provides a bridge to fans who’ve only seen Spider-Man in other media to read the comics. Just like his first issue of Captain America, Nick Spencer is able to hook readers with one moment. This is a moment fans have been waiting for years in the pages of Amazing Spider-Man, the reunion of Peter Parker and Mary Jane Watson. Hopefully this will attract more readers after the controversial story that ended Peter and MJ’s relationship (see One More Day). Also while Peter and MJ are back together, both characters have been through a number of changes over the years. Overall there is a lot of potential in this reunion. 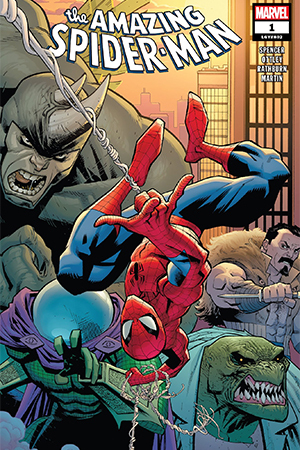 Art: One thing that got me excited for this new Amazing Spider-Man title is Ryan Ottley’s artwork. 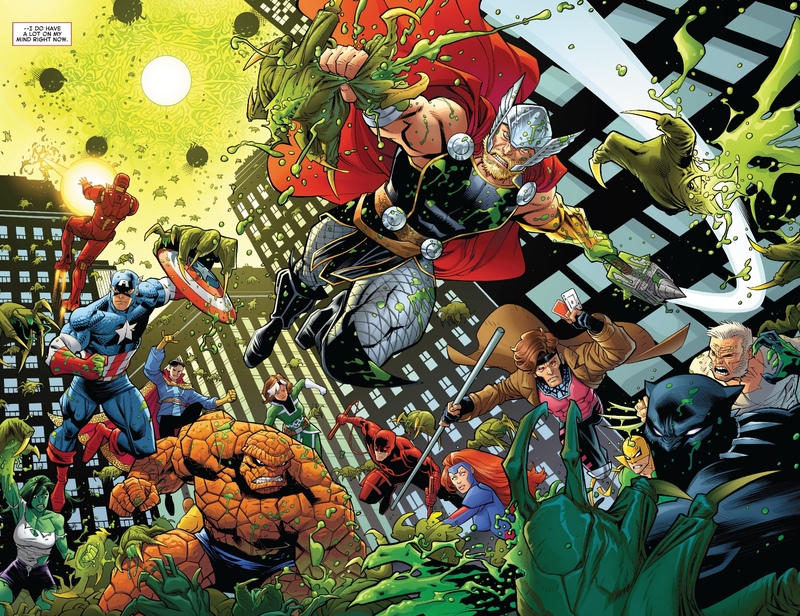 Ottley has a fantastic way of drawing superhero comics. He makes the characters dynamic and full of life while keeping facial expressions easy to read. Plus Ottley did the artwork on one of my favorite comic books Invincible. Although his design for Mary Jane does bear a strong resemblance to a character from Invincible, Atom Eve. Also we get a hint at a greater/long-term villain that readers don’t know anything about but thanks to Ottley’s design looks super creepy. Nevertheless, this issue’s artwork is outstanding. Verdict: Amazing Spider-Man #1 is a fantastic start to a new chapter for everyone’s favorite wall-crawler. This issue delivers a big moment fans have wanted for years. Plus it uses a plot-hole from the previous run to set up new and exciting directions. Overall, this is a must read for all Spider-Man fans.